Heading to Singapore, a track that should suit his SF71H, the only thing standing between Sebastian Vettel and victory is Sebastian Vettel. And probably Lewis Hamilton. This time last season Vettel was three points behind Hamilton in the race for the World title in a car that could not match the Mercedes; this year he’s 30 – and he’s in the best car on the grid. Vettel cannot afford any more mistakes. But that was said after Baku, after France, after German and again after Italy. Last time out at Monza, it was all set up for the Ferrari fairytale with a 1-2 on the grid and an expected 1-2 at the chequered flag. However, red mist from Vettel saw the German refuse to acknowledge that Hamilton had the better of him into the Roggia chicane and he instead slid across the track and into the Mercedes driver’s line. They touched. Vettel spun. He finished P4 while Hamilton was able to put in a late charge on Kimi Raikkonen to claim an unexpected Italian GP win. It would have been rather snarky of Hamilton to thank Vettel along with his Mercedes team for the win, but you wouldn’t have held it against him if he had. This weekend Vettel is heading to the scene of last year’s big, although not biggest nor of his own doing, mistake. In 2017, starting on pole position, he was challenged by Raikkonen and Max Verstappen off the line. The Dutchman touched Raikkonen, sending him across the track and into Vettel. The four-time World Champion tried to continue but with a damaged car spun and retired. It marked Ferrari’s first ever double DNF on the opening lap of a grand prix. The Scuderia, and more notably Vettel, have to avoid a repeat performance if the championship hopeful stands any chance of beating Hamilton to a fifth World title. He trails him by 30 points with 175 still in play. 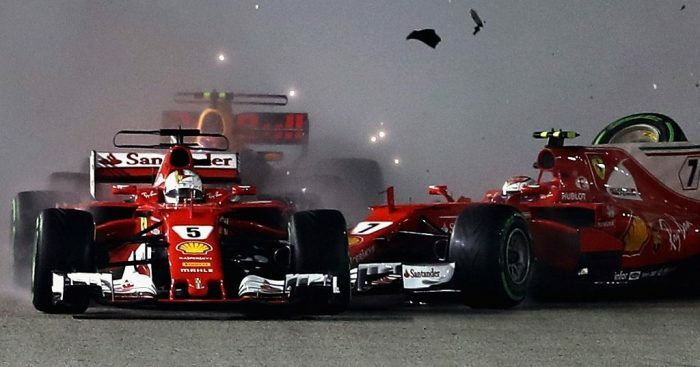 Although Mercedes have won the last two editions of the Singapore GP, they were helped in 2017 by that opening lap collision and again in 2016 when a suspension problem in qualifying meant Vettel started from the very back of the grid. The previous year, 2015, it was all about the German. It was also all Vettel in 2011, 2012 and 2013 making him the most successful driver in Singapore. The twisty Marina Bay street circuit with its 23 corners, lights, humidity and 100% Safety Car record seems to suit Vettel but the big question is can he rise to the challenge or will he once again be undone by his own mistakes. But while most fans tune in for the championship fight, behind them there are several drivers fighting for their careers. Stoffel Vandoorne was told last week he’s no longer a McLaren driver as of the end of this season while Brendon Hartley needs a “big improvement” if he wants to remain in Formula 1 next season. The sob story, though, could be Esteban Ocon. One of the more talented drivers on the grid, Singapore could yet be his final race with Force India before he has to make way for Lance Stroll, and maybe even make way from F1 altogether.